One of the greatest record labels in the history of American music is reissuing two monumental collections of their vaunted output. From 1959 until 1975, Memphis-based Stax Records and its sister label, Volt, were rivaled only by Motown for their volume of high quality soul, R&B and funk releases, roster of legendary artists, prodigious talent of its in-house songwriters and profound influence in shaping those genres. And, like Motown, Stax/Volt were also pioneers in promoting equality in music, bringing African-Americans out of the recording studio and into every phase of the production and distribution process—a bold, and often controversial, practice for a label based in the pre-Civil Rights South. The Complete Stax/Volt Soul Singles, Vol. 2: 1968-1971 and Vol. 3: 1972-1975, originally issued in 1993 and 1994, showcase the labels’ enormous output and formidable quality from an era when Stax had already established itself as an industry leader. Now, Stax, in partnership with Concord Music Group, is reissuing these historically significant collections in both digital and CD formats. For physical format, the re-issues improve upon the original issues with compact and stylish packaging as well as a full-color booklet of liner notes and in-depth essays by Stax historian Rob Bowman. The reissues also mark the first time that many of these songs will be available digitally. 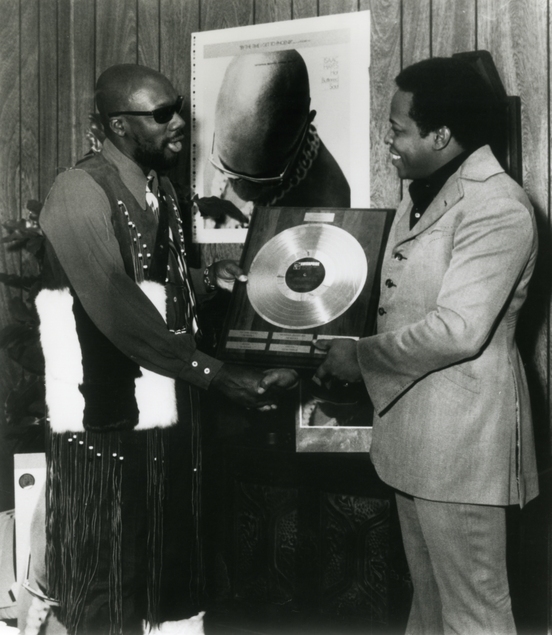 Isaac Hayes with David Potter. Many of the artists featured in these collections will be instantly recognizable to even casual students of American music: Isaac Hayes, Rufus Thomas, Albert King, Little Milton, Carla Thomas, The Staples Singers and the Bar-Kays. Others, such as master songwriter/vocalist Eddie Floyd, William Bell and Hot Sauce will excite serious genre enthusiasts and be welcome discoveries for first-time listeners. While it’s easy to get excited about the chart-busting, career-making hits featured in the collections, for true connoisseurs the real pleasure in these reissues may well come from its embarrassment-of-riches of interesting but lesser known works as well as the presence of less recognized but highly talented artists. The reissues of The Complete Stax/Volt Soul Singles ensures that many priceless treasures of American roots music remain in circulation. In the process, it will warm the heart of serious fans of soul and related genres while also being accessible to casual listeners.